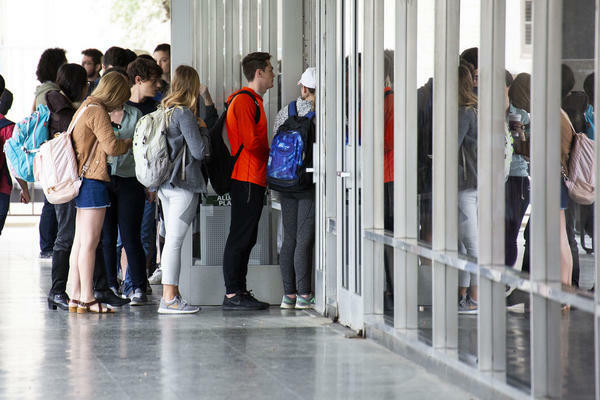 Voters line up to cast ballots on the UT campus last week. Ana Flores can vote for the first time this year. The 18-year-old lives in Houston with her mom. Like many young people who just got the right to vote, she was curious about what it would be like. Flores was registered to vote and aware of some of the races on the ballot; she said she was particularly excited about voting in the U.S. Senate race. But there was a big thing standing in the way of her actually voting: the Texas voter ID law requiring her to show a state-issued identification at the polls. Flores said she had had trouble getting an ID from the Texas Department of Public Safety before. Flores didn’t have the proper documents to prove she was a resident of Texas. She knew she'd have to try again if she wanted to vote this year. Luckily for her, a group called Spread the Vote started reaching out to students at her school. “Our focus is to make sure they have the ID so that they can actually vote,” said Christina Sanders, state director for Spread the Vote. Spread the Vote has been in Texas since May. Sanders said the group is helping populations who have the hardest time getting IDs, including the homeless population and students. “It is extremely challenging if you are 17 and eight months eligible to vote, or 18, and you don’t have a light bill in your name," she said, "and you don’t have a bank account in your name, or lease in your name to be able to establish yourself as a Texas resident." Sanders said this is also really hard for college students – particularly out-of-state college students. The list of IDs allowed at the polls is limited. While a handgun license, military ID or U.S. passport are allowed, for example, a student ID is not. People who face obstacles getting an ID can still vote in Texas, though. Federal courts forced the state to let people sign a legal document saying they had problems getting an ID in order to cast a ballot. But for low-income people who want to make sure they have the required state-issued election ID, state ID or driver’s license, it can be expensive. Sanders said her group helps cover those costs – and it helps people get supporting documents, including Social Security cards and birth certificates. She said many students don’t have those documents handy, for a whole range of reasons. Sanders said there's also a short window for students to get these documents, because government offices close roughly around the same time students are let out of school. “Going to get your ID to vote is not an excused absence,” Sanders said. Because of Spread the Vote, Flores was able to get an ID in time to vote early. She said voting – with her ID in hand – was easier than she expected. And Flores said she would probably vote again in the future. Unfortuantely, Sanders said, some students don’t get this all worked out in time. “We even had a student in Houston cry because of the documents not matching up,” she said. It's 9 a.m. on Halloween as Maryanne Walter opens her front door in Plano. She's about to leave for work and called Rideshare2Vote for her 22-year-old daughter, Kelley Reinlein. "Kelley is a registered voter and this is not her first time to vote, so she should have no problem. This is her first time to vote independently, so rideshare is a very important part." 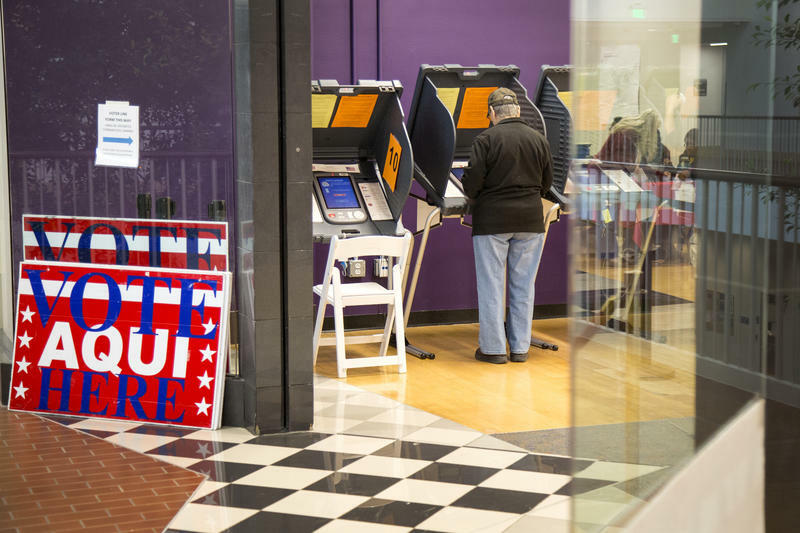 Election officials in Texas are working to address concerns about a slew of voting machines currently being used in this year's midterm election. They say user error is mostly to blame because voters are not waiting for screens to load on the state's aging machines. Attorneys with the Texas Civil Rights Project say they have heard about issues, particularly with people voting a straight-ticket ballot on Hart eSlate machines, which are used in many counties in the state. Early voting has been underway in Texas for the past week.